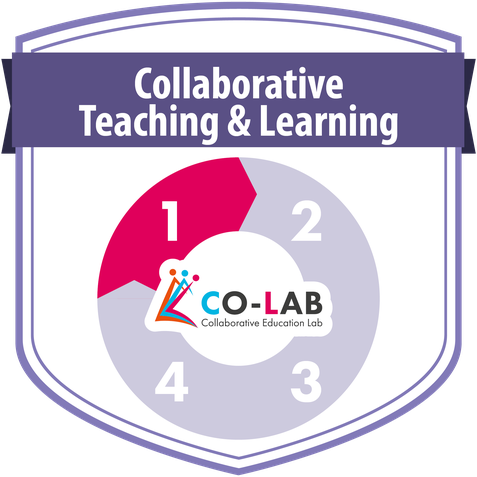 1.1 What is collaborative learning? In today's world when people are globally connected, not much work is done by one person only. More and more people work together when they need to come up with new ideas, to discuss an issue, to find answers, to solve problems, to create solutions, to reach important decisions or to create new products. In order to do all this, they need to have well-developed collaborative skills to work efficiently and productively as members of a team as well as to work effectively and respectfully with diverse teams. 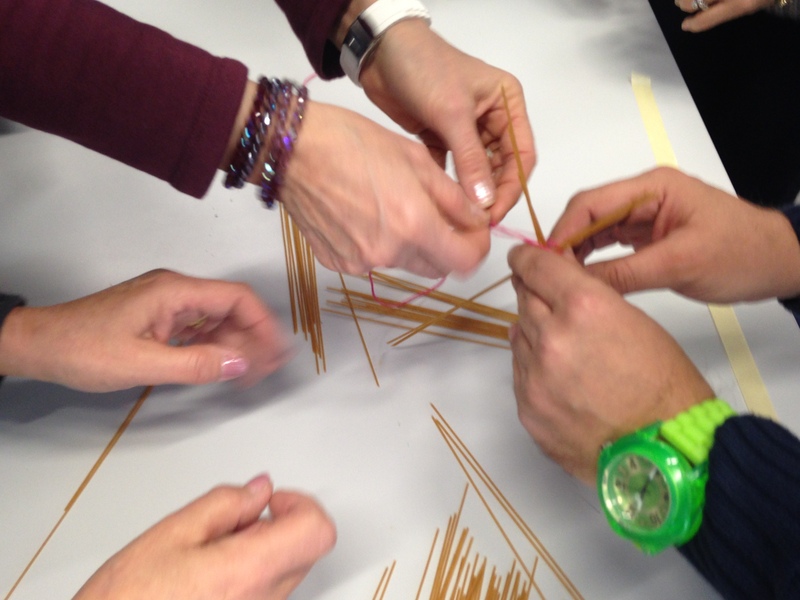 Learning how to work in a team must start at school. Students should be taught collaborative skills at an early age. Collaboration skills encompass the skills of negotiation, conflict resolution, efficient distribution of tasks, decision making skills, respecting the ideas of other people, integrating ideas into a coherent whole, teamwork and leadership skills. individual accountability: each team member is responsible for a task that he or she must complete in order to successfully finish the team work as a coherent whole. 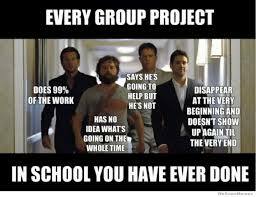 group accountability: students must work together to produce the final product. Another important component of collaborative work is that students are able and are allowed to make SUBSTANTIVE DECISIONS that shape the content, the process or the product of students’ work. Students are making substantive decisions when they are actively resolving important issues that will guide their work. Students are making substantive decisions together when they interact with one another to jointly arrive at their decision. During this process, students share ideas, listen to each other, negotiate and debate if they do not initially agree. It is also a good idea to encourage students to decide on strategies which will help them reach agreement: for example, they have to convince each other, or they will take a vote and go with the majority opinion. In this way students will learn how to be flexible and willing to make necessary compromises to accomplish a common goal. To the above, I would add that equally important for students in collaborative activities is the opportunity to give and receive CONSTANT FEEDBACK. As they work in small groups, students can easily and immediately respond to their peers' ideas and opinions by giving personalized feedback. I highly recommend reading the ITL Research 21st Century Learning Design. 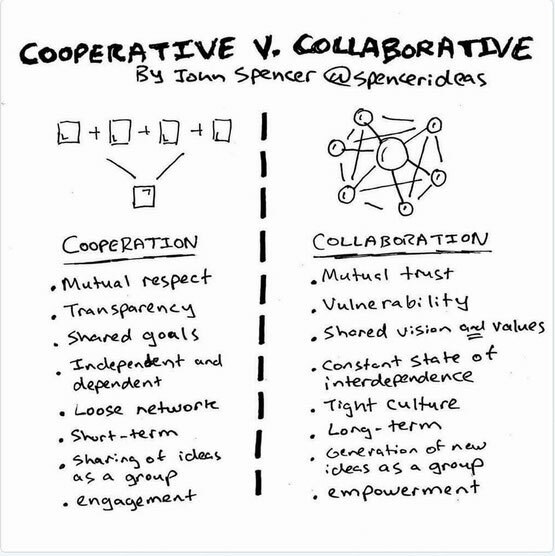 One of my course mates, Niko Lewman, has shared this excellent visual on the difference between cooperative and collaborative learning. In his post, Niko points out that both of these two approaches are valid and useful. Neither is superior or better than the other. It depends on the learner and the learning context which of the two should be implemented in the learning process. This is a photo of the Future Classroom at my school. There are 30 tablets, a teacher laptop and an interactive whiteboard in the classroom. But it's more than technology that makes this classroom an inspiring space to learn. The flexibility of its design appeals to learners. 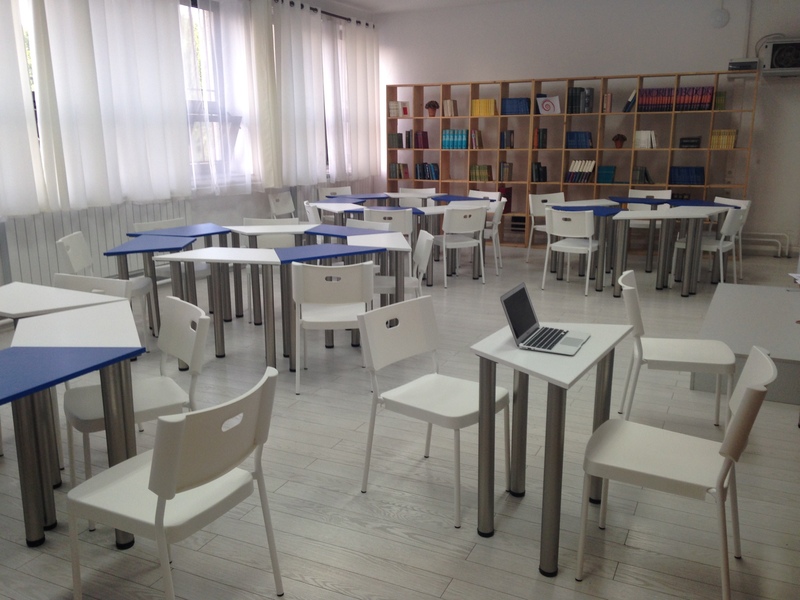 The desks and chairs are light and portable and can easily be moved and arranged in the way it best fits the learning activity. Once I arranged the desks and chairs in a traditional way - in rows, with students sitting one behind another. It was incredible to see how uncomfortable my students felt - I could literally see uneasiness and discomfort in their eyes so of course, I asked them to rearrange the seats and sit in groups of as many students as they liked. I strongly believe that a learning space has a huge impact on student learning. It makes students feel more relaxed and ready to learn. Last year I participated in the Project Based Learning Course organized by the EUN Teacher Academy. I think PBL is a great way of learning. Students are not only engaged but also empowered to learn because they are held accountable for the process and for the outcome of their learning. They have taken control over learning and they are responsible for it. I like the way project-based learning is organized in the Italian classroom illustrated in the video below. I especially like the idea of having students discuss their learning process and the outcomes they achieved. Reflection is a very important step in the learning process, which leads to better acquisition and higher retention of knowledge. I sometimes ask my students to reflect on their learning, but I believe I should do it more often. The reason why I don't do it on a regular basis is the lack of time. However, after watching this video, I think teachers need to dedicate more time to reflection and self- and peer assessment in order to help their students achieve better results. When designing activities we should pay careful attention to the problems our students have and focus on the activities that will help them achieve better results. Weaker students get a chance to perform better and shy students can enhance their self-confidence when they work in groups because they feel less intimidated by the other students. They feel more comfortable talking when there are not so many students around. Students are given voice and choice. They can choose by themselves how they will organize the learning process and what the final product will be. Based on my own experience, students more often than not want me to tell them how and what they need to do. They seem to lack self-confidence and don't believe in themselves, so I my job is also to convince them that they are able to make substantive decisions by themselves without me. However, if they need my help and guidance they can count on me. It takes time to teach them to be independent, but in the end they are delighted to see that they succeeded. It is not the teacher who asks questions. Students should be encouraged to ask questions, be curious, inquire, try to find answers from different sources and learn from their peers. The teacher is there to guide students, facilitate the learning process, give feedback to the students and encourage and provide students with opportunities for peer- and self assessment. Anna's idea to have her students plan their activities by using the tool Scrumy was excellent, because it helped them to keep on the right track. Anna's students also had to write short reports in the form of check lists or mindmaps to illustrate their progress. Such reports were also great for reflection. I couldn't agree more with Monica when she says that it is difficult to guarantee the quality of collaboration. There are always some students who put a lot of effort into the collaborative work and those who don't care so much about it. 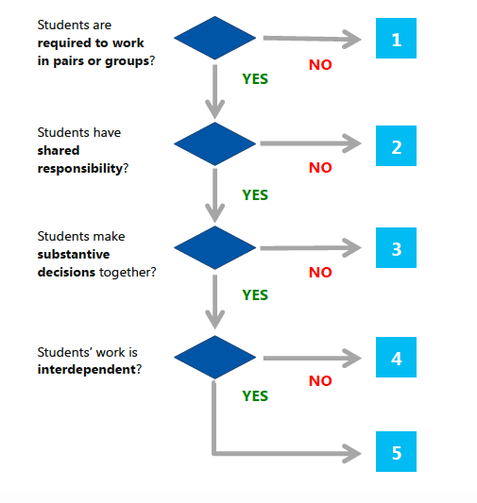 Here's a humouros visual on group work by College Times. Students who work hard may feel rather frustrated if they get the same grade as those who avoid doing the tasks. In order to just to all the team members we can make use of rubrics. We can give a rubric to students before they start working in groups and ask them to assess each other's work. 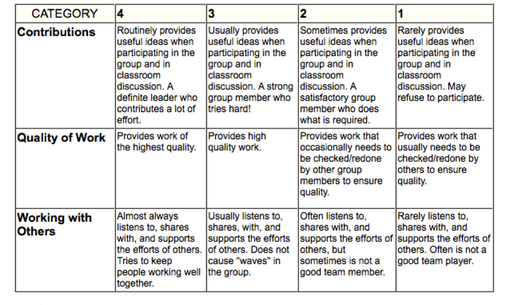 Here's a rubric that I made on Rubistar for my students to peer-assess collaboration. I'm a huge supporter of teacher collaboration. I do it on a daily basis and I function much better in a team than on my own. I've collaborated on all kinds of projects with educators from my school and from schools and institutions from all over the world. I have collaboratively designed online courses, written book chapters, hosted webinars, led Twitter chats, delivered keynotes and presentations, organized school exchanges, carried out projects... I simply love collaborating with my colleagues. I frequently engage my students in collaborative activities, but not all the activities require the same level of collaboration. I use this activity as an icebreaker when new students come to my school. They divide a piece of paper into 4 equal parts and in each part they draw pictures that describe their family, their wishes, their hobbies and what they do. They are not allowed to use words, letters or numbers. After that, they do a pair-share activity, in which they try to find out more about their partner, based on their drawings. Finally, instead of introducing themselves to the whole class, they introduce their partners. I've noticed that students talk about their partners in front of the whole class more willingly than they would about themselves. They feel less shy and more confident, as they are not supposed to know everything about the person they've just met. In one of my eTwinning projects, my eTwinning colleague and I engaged our students in creating a collaborative digital story to wrap up their participation in a Coursera MOOC. We divided them into 4 groups by using the tool TeamUp Aalto. For each group we opened a TodaysMeet room for communication and a Storybird account for digital story creation. Then we let the students decide on what kind of story they wanted to write, how often they were going to meet and communicate and how they will distribute the work among themselves. We didn't interfere in any of their tasks. We also let them know that they could use any other tool if they didn't feel comfortable with the ones we suggested. At the end they voted for the best story by using Tricider. They did a great job (which was later awarded with national prizes in both countries).